WELCOME To San Diego Aquatic Club! We are a community-based aquatics program dedicated to providing the youth of North County San Diego, including Rancho Bernardo and Rancho Penasquitos, the opportunity to be the best that they can be. A professional staff guides all of SDAC's aquatics Programs. SDAC offers the following programs: pre-competitive swim program, competitive swim program, pre-competitive summer swim team and private lessons. Please see our Programs page fora description. The SDAC Team Handbook and the Tryout Information should help to answer questions you may have. On behalf of SDAC, the entire coaching staff welcomes you to the SDAC family. The SDAC summer swim team focuses on building endurance and improving skills in all four competitive strokes: freestyle, backstroke, breastroke and butterfly. The swimmers will be under the supervision of United States Swimming registered coaches, who have many years teaching experience. The swimmers will participate in fun meets. Games and drills will be taught while having fun and building endurance. The cost for the summer program is $300.00. Please visit our Summer Swim Team page for more information. 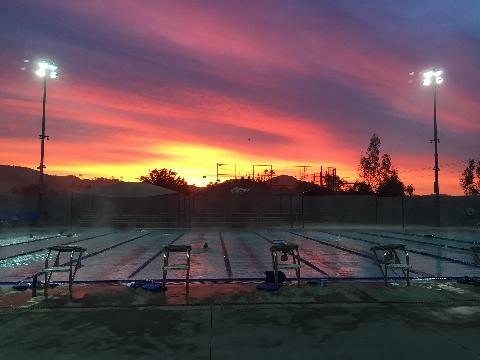 The San Diego Aquatic Club supports and endorses the Learn to Swim Program and Water Polo Camps offered at the Rancho Bernardo High School Pool. RBHS offers quality swim classes for children ages 3 to 16. The RBHS approach to teaching swimming is based on the Red Cross certified method. Please visit the Summer Swim Lessons page for more information. The SDAC Store for all your swimming needs is all set up at Paradowski’s Swim and Sport. You are now able to purchase, training paddles, training suits, competition suits, team bags, team parkas, team caps, etc all from the Paradowski’s Swim & Sport website. Please take a moment to check it out and show some team spirit at the next meet. The SDAC Store for team apparel is finally complete. You are now able to purchase t-shirts, sweatshirts, ball caps, hats, shorts, pants, etc all from our on-line store. Please take a moment to check it out and show some team spirit at the next meet. Time Standards Where do these time standards come from? By rule, our San Diego ABC time standards are set to equal those published by our large neighbor LSC to the north, Southern California Swimming. They call their time standards Blue-Red-White, but other than that they are identical. These time standards are very stable and rarely change from year to year. Having equivalent time standards makes it easier for swimmers to enter and compete in the other LSC’s swim meets. On the other hand, our Junior Olympic time standards are set locally here in San Diego and are crafted to select approximately the 24 fastest swimmers in each event based upon the average results in the event over the past 3 – 5 years. These time standards can change annually to reflect changes in the size and performance of various age groups. Have you ever wanted to be able to follow your kid’s progress and connect to the team? Here is an app for you. It is powered by our web host “TeamUnify.” I encourage everyone to do the same, but use the parent app. Swimmers and Parents from USA Swimming You have just joined a community of 300,000 dedicated beginners, competitors and Olympic swimmers who all share a passion for our sport. You'll swim together, track times and rankings, share tips and training advice, and most importantly, have fun. The USA Swimming kit includes information on what to expect at a swim meet, how to interact with your child's coach and how to track times and help your child get the most out of swimming. You'll also find discount offers from USA Swimming sponsors and a fun video that you can customize to include your child. Whether this is your first experience as a swim mom or dad, or if you've raised a whole swim team, make sure you are taking advantage of all USA Swimming offers! USA Swimming's "Deck Pass" Swimming has long been a sport about achievements. Now, with the launch of USA Swimming?s ?Deck Pass? ?, a new online and mobile application, swimmers can easily connect with one another and share their achievements with other members of the swimming community. Deck Pass? is an innovative digital application that lets swimmers track their best times, set goals and earn digital patches for their accomplishments in the pool. It?s easy, free to use and is designed to let swimmers capture what they?re accomplishing in the water online and then share with their friends and family. Users can access Deck Pass? online or via a free mobile application. In addition, there are several water polo tournaments scheduled at the Rancho Bernardo pool. During these dates we will not be having practices for all levels. These dates will be announced at a later date.